How come it's a 1978 and has no K-Jet? Is therea story behind it? Welcome, your car looks very nice! Welcome, yes very nice colour and the stance is great! So it sounds like you went to electronic fuel injection on your car? Yes, great stance indeed. 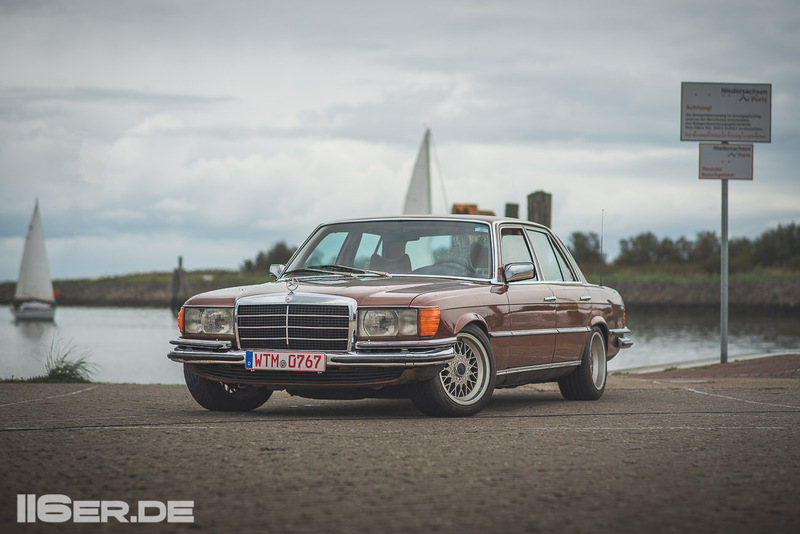 Would love to replicate on my 450SEL. Can you please tell me what your suspension modifications were and wheel/tyre combination you chose? Are there any limitations, ie tyre rub, suspension bottoming out quickly? Sieht Klasse aus. Wuerde ich gerne an meinem 450SEL nachvollziehen. Kannst Du mir bitte verraten welche Modifikationen an der Federung vorgenommen wurden und welche Raeder/Reifen drauf sind? Giebts irgenwelche Einschraenkungen, wie Reifen reiben an den Waenden oder Federung schlaegt schnell auf? Hi Daniel and welcome, great looking 116 just the right stance on the road. Hello again or as we say here.. : Moin! K-Jetronic : my W116 still have the mechanic KA-Jetronic but when i bought the car, the K-Jet won´t run, so i invest time&money to bring it back to life, a big help was http://www.ferrari400parts.com/ , who rebuild & test my WUR. i changed and/or clean a lot of parts, now the engine runs well again. I’ve been following you and your build on instagram. Your doing a great job so far, keep up the hard work. Thanks for the rim info I had messaged on instagram. Those seats are lush!. New covers or original? Neu ueberzogen oder nicht? Thanks much for the info on the wheels and tyres. If you ever find out about your suspension setup please share that info too.